Aaron Kampman will be glad to put his hands on the turf at Jacksonville next season. He returns to defensive end, signs with Jaguars. Aaron Kampman never fully took to playing linebacker in Green Bay's 3-4 defense. He missed the final six games of 2009 after tearing his left anterior cruciate ligament. After turning 30 in November, many think Kampman's better days might be in the past. But make no mistake about it, when Kampman signed with Jacksonville on the second day of free agency, Green Bay lost its best defensive player of the past decade and an all-time great Packer. 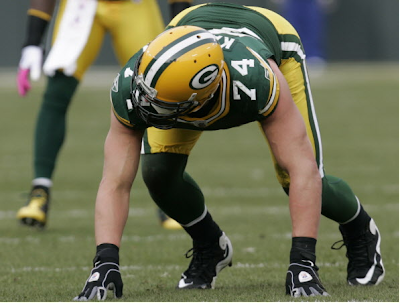 In eight seasons with Green Bay, Kampman went from an unheralded fifth-round draft choice to a player that posted the fourth most sacks (54) in franchise history. He exemplified hard work, professionalism and maximized every ounce of talent he had. "Aaron Kampman, you definitely want to wish him the best," Packer coach Mike McCarthy said at last weekend's Fan Fest. "He was an excellent representative of the Green Bay Packers both on and off the field. You never know, you may have an opportunity to work with him again someday. That's the type of outlook that I have when you lose a person like Aaron. "He was a joy to coach, a very productive player on the field, but even a better person in the community and among his teammates in the locker room. We do wish him the best, but this is a part of our business." Despite the knee injury, the Jaguars liked what they saw and gave Kampman a four-year, $26 million deal with $11 million guaranteed. Green Bay made an offer as well, but it isn't believed to have come close to what the Jaguars offered. "I think for me the better fit was down here," Kampman said. "I think that the direction of (Green Bay's) organization maybe didn't include me as much as it had in the past. So I think it was the right time for me to make this transition." After the Packers switched from a 4-3 defense to a 3-4 scheme, there was no guarantee that Kampman would stick around. The standout defensive end was asked to switch to linebacker - a position that was completely new and unnatural to him. Kampman had 42 tackles and 3 1/2 sacks during nine games last season, but he didn't have nearly the impact at linebacker as his first seven seasons at defensive end. "I'll just say this: I like to go forward," Kampman said. "There are a lot of nuances at outside linebacker. I'm a guy who likes to work on his craft and hone it down to the minutest detail. I was doing seven-on-seven in practice rather than one-on-ones. Normally, when I break down film, I look at offensive tackles and I study them to the T, but (at outside linebacker), I had to break down receivers and running backs. "It was a more difficult transition in that sense and then just being out there in a two-point rather than a three-point stance. So I'm excited to put my hand back on the ground, very excited. I have a fire burning to do that." Kampman certainly played with that fire during his time in Green Bay. Kampman was the poster boy for all of the NFL's underdogs. Despite a stellar career at the University of Iowa, NFL scouts were never sold on Kampman. He ran the 40-yard dash in a disappointing 4.87 seconds at the 2002 NFL combine, making it questionable if he could succeed at defensive end. He also lacked ideal size (6-foot-4, 284 pounds) to survive inside at defensive tackle. So it wasn't a great shock that Kampman was still on the board for Mike Sherman and the Packers to select in the fifth round of the 2002 draft. Kampman got his chance to shine early when injuries sidelined players such as Joe Johnson and Vonnie Holliday. By 2004, the Packers committed to Kampman as a starting defensive end and he made the organization look fantastically smart. From 2006 to '08, Kampman's 37 sacks were the third most in football. He sculpted his body and became a lean, yet powerful edge rusher. And he watched enough film to rival Roger Ebert. "You can go down and down the list and find a lot of guys that are drafted late, then come here and want to prove to everybody that they can play," wideout Donald Driver once said of Kampman. "And Kampman's one of those guys." Kampman, a man of great faith, became extremely involved in the Green Bay community. He also remained loyal to his roots and returned to Parkersburg, Iowa - the area where he grew up - and played a role in that town's cleanup after it was struck by an F5 tornado in 2008. Through it all, Kampman played terrific football for Packers. He went to the Pro Bowl in 2006 and '07 and led the NFC in sacks in 2006 (15 1/2 ). "You can win a lot of games with a team full of Aaron Kampman's," said Bob Sanders, who was Green Bay's defensive coordinator from 2006 to '08. "He never quits. He's a tremendous worker, sets a great example for the rest of the team. Really, he's all you ask for as a coach." Green Bay will move forward with second-year man Brad Jones, who filled in admirably when Kampman was injured last year. The Packers could take an outside linebacker somewhat high in April's draft as well. As for Kampman, he'll try finding new life in Jacksonville, where he'll play right defensive end for the first time as a pro. "I think I can help; I hope I can help," he said. "I've been on a very young team in Green Bay. What I have learned is that with the great teams I have been a part of, they care of one another. "That is how you build consistency and you build championships over time, you're consistently good. Hopefully, I will have an opportunity to get to know this locker room and over time develop that respect to where I can provide a positive influence." That's something he certainly did during eight memorable seasons in Green Bay.